Not sure what to get your loved ones this year? Try shopping for them by personality type! 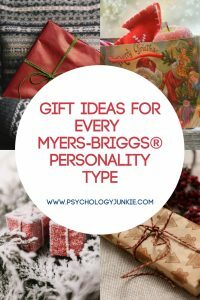 Over the last year and a half I’ve spoken with over a thousand individuals from all of the 16 personality types to determine which gifts they like most. These guides will not only tell you WHAT people like to get for their birthday or Christmas, but how they feel about giving and receiving gifts. Keep in mind, every individual is unique! No two ENTPs or ISTJs or ENFJs are alike, so pay careful attention to the individual interests and passions of the person you’re buying for. Sensing Judging personality types showed the greatest preference for practical gifts. They wanted gifts that were functional and would make life more efficient and organized. ISFJs and ESFJs were more prone to wanting sentimental gifts like meaningful jewelry or hand-written letters. Check out the links below for more details! Experiences were at the top of the list for most SP types. These individuals would usually prefer going on an adventure together to having a material gift. They also really enjoyed food and drink related gifts; delicious chocolates, homemade cookies, wine, and fancy coffee blends were all mentioned! Hand-written letters, time, books, and charity-related gifts were all frequently mentioned by NFs. These individuals care more about the meaning behind the gift than the gift itself. INFs were more likely to feel self-conscious opening gifts in front of other people and tended to feel guilty about receiving gifts if they seemed costly. As a whole, NTs favored technological gadgets, books, and money more than many of the other types. They were also the least comfortable with opening gifts in front of other people. They often felt that they had to feign a response that would please the gift-giver, and this was stressful for them. ENTPs were the only exception to this rule! Do you have any gift ideas you’d like to add? Share your thoughts and suggestions in the comments!